A viral photo of a little boy wearing black Wellington boots and a home-made shirt stopped us in our tracks. The most striking feature of the photo was the plastic stripy carrier bag he wore over his jumper. It was fashioned into something like a footballer’s bib, with the word “Messi” and the number 10 written on the back in marker pen. The photo was first posted on Twitter by a Messi fan using a now-defunct handle, @illMindOfRobin, on 13 January 2016. But its origins were murky – tweets at the time hinted that the photos had originally come from Facebook. Soon, a global hunt was on to locate the boy in the photo. The person behind @illMindOfRobin suggested the photo was taken in Dohuk (also spelled Duhok), a Kurdish region of Iraq. 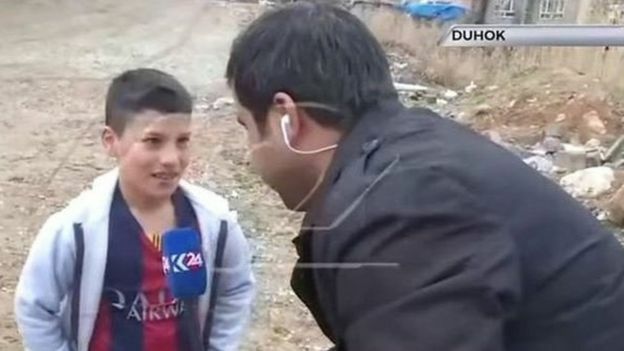 He wrote “Messi in Kurdistan” and “Messi in Duhok, Iraq” but later confessed to BBC Trending that he only spread the rumour to give the place “slight recognition”, as his parents grew up there. But the Iraq story had already taken hold, and it even appeared even more solid when news agency Kurdistan 24 sent a camera crew to Dohuk and reported that they had found the boy. Numerous other news outlets around the world followed suit and named the boy as seven-year-old Homid who made the famous plastic shirt two years previously because he was such a big fan. He was also seen wearing a standard Barcelona shirt with the number 10 on the back. But his story sounded fishy. While there was arguably a slight resemblance between Homid and the photograph, they didn’t appear to be the same boy. BBC Trending scoured social media and found messages from someone claiming to be the boy’s uncle. We contacted him to verify his claims. 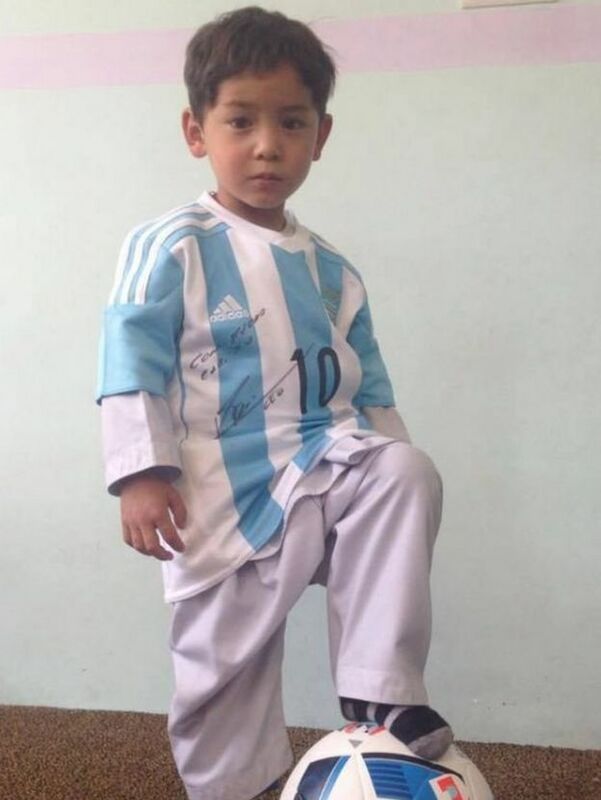 The uncle, Azim Ahmadi, led us to his nephew, Murtaza Ahmadi – the real boy with the homemade Messi kit. Murtaza lived with his family in the eastern Afghan province of Ghazni, and through his uncle we managed to speak to his father, Arif Ahmadi. Mystery solved – but the story had only just begun. 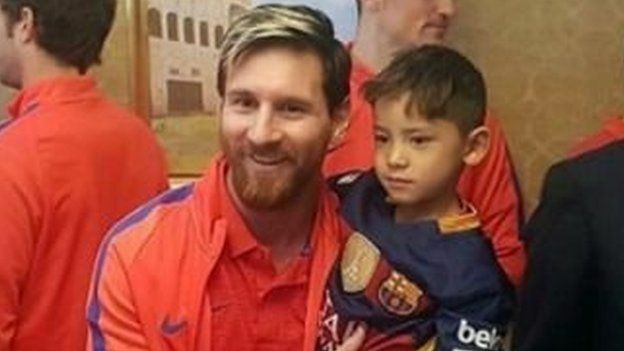 Murtaza fast became an internet star, and there was a rumour that a meeting between the boy and Messi himself was being planned. The Afghan Football Association contacted Barcelona to try to make it happen in February. But instead of a face-to-face meeting, Murtaza was sent a package containing football shirts personally signed by his hero. Along with the media interest came some other, less welcome, attention. In May, reports emerged that the family had to flee their home in Afghanistan and move to Pakistan after they were threatened. But despite the fame and the new kit, there was of course no money to be had. The father said the situation was “very risky” and that gangsters had threatened to kidnap the boy. ver the next few months there was concern about their fate, as repeated attempts by BBC Trending journalists to contact the family failed. But behind the scenes, a positive result was beginning to play out. The chance came in the form of a December friendly between Barcelona and Saudi squad Al-Ahli.